The goatee. You know, that not-quite-a-beard, not-quite-a-mustache style of facial hair that has seen a resurgence in the past several years (and moved beyond its beatnik and counter-cultural reputation of yesteryear). 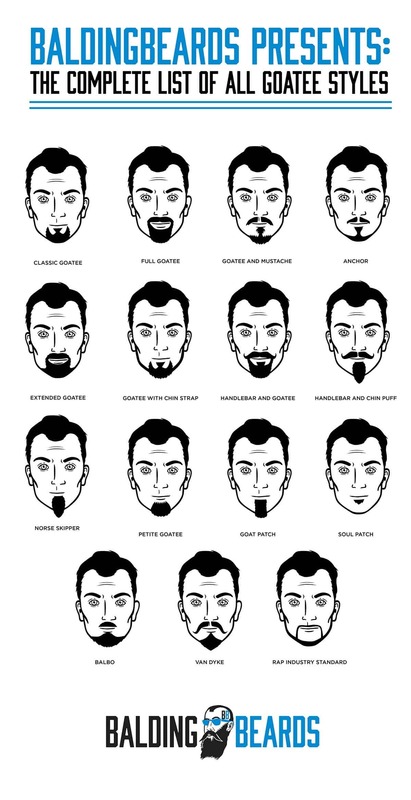 As we have with beards and mustaches, we now present you with a list of goatee styles and an easy-to-reference goatee styles chart. Defining what actually constitutes a goatee has been open for debate throughout history. Generally speaking, it combines elements of both a mustache and a beard while leaving the cheeks clean-shaven. It’s also generally accepted that a goatee’s name is derived from the long fur that’s found under the chin of a goat. The half-man, half-goat Greek God Pan is depicted as having a goatee of some sort. Yes, the goatee has been around a long, long time. As mentioned, we’ve included a goatee styles chart that will serve as a quick, but informative, reference guide for anyone who’s looking to learn more about this unique type of facial hair. What is it? The classic goatee is just what it implies – the basic, foundational style of a goatee that so many men wear. Simply put, it’s a tuft of hair on the chin trimmed neatly. Put another way; it’s a chin beard under your bottom lip without a mustache and with your cheeks shaved clean. Who is it for? Men with round faces will never go wrong with the classic, goatee-without-mustache look. Who wears it? Academy Award-winning actor Benicio del Toro has worn a classic goatee – and worn it well. What is it? When people think of goatee, they usually think “full goatee.” The mustache continues around the side of the mouth to join with the unshaven beard. Who is it for? You want to keep hair on your chin if you have a diamond-shaped face and the full goatee meets this requirement. Who wears it? Check out actor Will Smith. What is it? The goatee and mustache is what its name implies: a mustache connected to a goatee. From there, it can be transformed into many different styles, however. But there’s no question that it’s a classic look. Who is it for? The goatee and mustache is ideal for men with square faces, who may want to avoid full beards. Who wears it? Many, many men have favored this look, from Tom Selleck to Jeff Bridges and beyond. What is it? The Anchor gets its name because it looks like the nautical ship equipment of old. It’s not easy to pull off but can be done by combining a chinstrap beard with a well-groomed pencil mustache and soul patch that extends to the chin. Who is it for? This is another style that will give a round face a narrower look, but it works well with men who have triangular faces, as well. Who wears it? One of the many faces of Christian Bale has been graced with an admirable Anchor goatee. What is it? The extended goatee is a mustache extending into a beard, but without sideburns. Very similar in style to the Hollywoodian beard. Who is it for? The extended goatee is a great shape if you have a long (oblong) face. Who wears it? Actor Jake Gyllenhaal has sometimes sported an extended goatee, along with several other facial hair styles. What is it? If nothing else, the chin strap requires discipline. It will need rigorous upkeep to keep it neatly confined to the jawline (while not busting out into a true beard). Combining it with a classic goatee is an interesting look. Who is it for? This another solid choice if your face is long/oblong. Who wears it? Someone, for sure. What is it? A handlebar mustache with a goatee. Neither are connected. Who is it for? A long face also provides a good foundation for the handlebar and goatee. Who wears it? Saddle up, fellas. American Wild West hero Buffalo Bill sported a handsome handlebar and goatee. What is it? This style combines a handlebar mustache with a chin “puff” that extends downward (kind of like a soul patch on steroids) beneath the chin. A facial style with many identities, it’s also known as the chin strap with a mustache, and the Napoleon III Imperials. Who is it for? Check it out, you square- and diamond-faced men. Who wears it? Mel Gibson, for one. What is it? The Norse Skipper is a long chin puff that goes no wider than the corners of the mouth. Imagine an upside down teardrop that covers – and extends a few inches beyond – the chin. Who is it for? If you have a round face, you can use the Norse Skipper to focus attention on your chin, but the Norse Skipper works well with other facial shapes, as well. Who wears it? Anthrax guitarist Scott Ian is known for his Norse Skipper, as well as his crunching, heavy-metal riffs. What is it? This type of goatee starts just beneath the lips and extends just beyond the chin to resemble an upside-down teardrop. Let your normal goatee grow for a couple of weeks before shaping it into a petit goatee. Who is it for? Square-faced men: this goatee’s for you. Who wears it? While there’s nothing petite about the band Metallica’s sound, axeman James Hetfield has been known to wear a Petite Goatee. What is it? A nice patch of hair confined exclusively to the chin (while extending beneath the chin). You’re channeling your inner goat with this style. Who is it for? The Goat Patch works with most facial shapes, but diamond- and triangular-shaped faces provide an ideal foundation for this style. Who wears it? Not overly common among celebs but not unpopular among American baseball players, who have ventured a long way down the facial hair trail ever since the Draconian reign of team owners and managers during the sport’s “Golden Era” was finally loosened. What is it? Simply put, the Soul Patch is a short patch of hair beneath your bottom lip. One of its strengths is its versatility because it can be blended with many different facial hair styles without having to be altered. Who is it for? 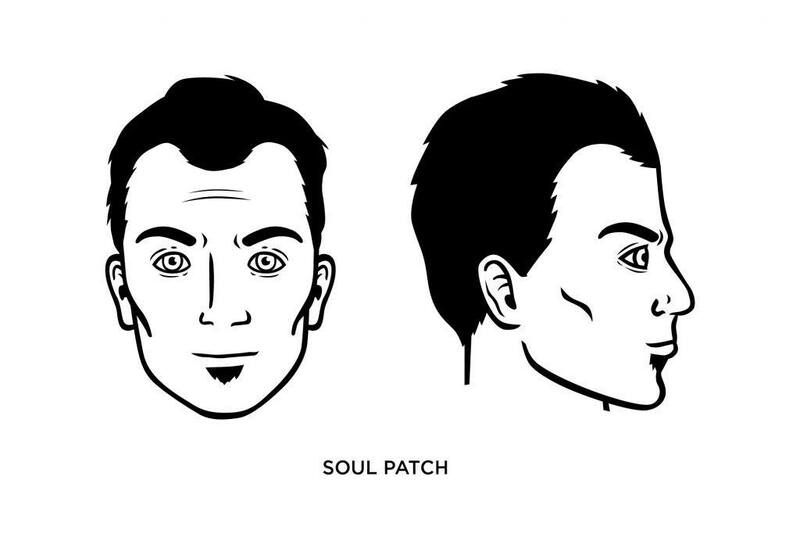 The Soul Patch can also help elongate the look of a round face. Who wears it? Actor Kevin Costner has been seen with a Soul Patch, which was also worn by blues guitarist Stevie Ray Vaughan. What is it? The Balbo has been referred to as a beard with two or three sections. It’s a mustache combined with hair on the chin, including a soul patch. Who is it for? The Balbo is a nice fit for square- and diamond-shaped faces. Who wears it? Named for Italo Balbo, a Mussolini goon during World War II, it has been well-represented in modern times by actor Robert Downey Jr.
What is it? Isn’t this what they always used to call goatees? Seems like it, especially if you remember the 1960s and 1970s of American culture. But, to the point, a Van Dyke specifically refers to a mustache and hair on the chin with the rest of the face shaved clean. You can spice it up with a handlebar mustache. Who is it for? A man with a longer face and pointed chin would look particularly good with a Van Dyke because it would help make the chin appear more rounded. Who wears it? The Van Dyke is named after the 17th century Flemish painter Anthony van Dyck, whose self-portraits helped popularize the look. Many men wear it today or have worn it, including actor Johnny Depp. What is it? It’s popular among rappers, hence the name. It consists of a pencil-thin ring around the mouth that skirts the top lip, follows the sides of the mouth down to the jaw, as well as following the jawline along the chin. The key is keeping it thin – very thin. Who is it for? The Rap Industry Standard is a good choice for men with round faces because it will narrow the face at the sides and make it seem slightly longer. Who wears it? Rapper extraordinaire Kanye West has worn the Rap Industry Standard. Though certainly popular in more recent popular culture, the goatee has, well, a sort of dubious history. As mentioned, the half-man, half-goat Greek god Pan is usually depicted as having some sort of goatee. He was considered the god of shepherds but was also a symbol of wildness. And then you throw Satan into the famous-goatees-from-history mix – thanks to Christian imagery – to really give the goatee a pagan reputation. The goatee, perhaps because of frightening imagery (or, imagery that was intended to frighten and keep mortal souls on the right path) never really became popular until Anthony Van Dyck in the 17th century. Van Dyck’s self-portraits, as well as his paintings of King Charles I, brought the goatee into the mainstream – or at least into more polite, sophisticated circles beyond half-animal humans and the Devil. However, there may be other reasons why the goatee, at first glance, was alarming back in the day. Researchers suggest that its downward triangle shape sends a subconscious warning bell. Combine that with demonic imagery and you had the element of danger neatly contained within a suddenly popular facial hair style. 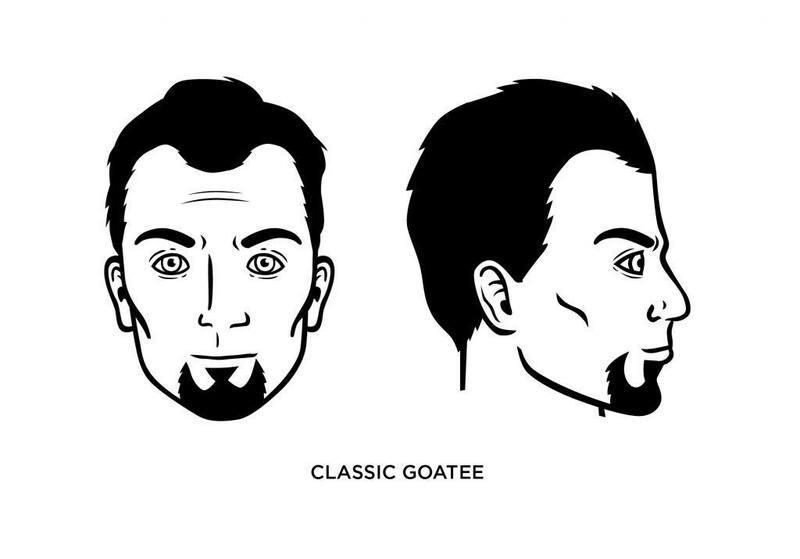 The goatee, like many things, gained and lost popularity in the ensuing centuries. Napoleon famously wore won, as did Buffalo Bill and General Custer before he succumbed to the Battle of Little Bighorn beatdown. Other famous wearers include Abraham Lincoln, Colonel Sanders of Kentuck Fried Chicken fame, Frank Zappa, Che Guevara, Steve Austin – and many, many more. In America, the goatee re-emerged on the popular scene thanks to jazz musicians and beatniks (or, Beats) of the 1940s before waning, but then found new life in the 1960s as a “counter-culture” look (once again, the goatee veers from the beaten path), and in popular entertainment was worn by folks such as “hippie” cartoon character Shaggy Rogers of the Scooby Doo series and actor Bob Denver as the beatnik Dobie Gillis. Of course, Denver was clean-shaven for his role as Gilligan on the TV sitcom Gilligan’s Island. And before that, bohemians in Paris favored the goatee in the later 19th century. French poet Charles Baudelaire wore a beard/mustache combo from time to time. The 1970s saw the emergence of the mustache – it seemed like everyone’s dad wore one, some successfully – but the goatee dipped its toe back into the water in the 1980s when stubble became fairly popular again. In the 1990s, and continuing today in what’s considered the “Golden Age” of goatees, the goatee became a safe-bet, mainstream look. A “mountain man” beard signified rebellion more than the goatee and other facial hair styles). Everyone’s dad has traded in his mustache for a goatee, or so it seems, and aging country musicians and minor celebrities such as Larry the Cable Guy and the chef Guy Fieri have helped to further implant the goatee into the public’s consciousness. Grunge rocker Kurt Cobain made it more acceptable to the younger generation. There are other reasons why the goatee has become a go-to look for many men, including the fact that it’s relatively easy to grow no matter what style you choose. Men in their late teens or early 20s who are still a step or two removed from being able to grow a true full beard can grow a goatee because hair on the upper lip and chin tends to come in more densely than other parts of the face. Race may also play a role; African-American men may find it more difficult to grow a beard (or find that it comes in more patchy than men of other races) and opt for a goatee instead. But that’s not to say, of course, that men of all races shouldn’t try to grow all sorts of beards. You’ll never know unless you try, or as they say in the American lottery business, “You can’t win if you don’t play.” And whether it’s a goatee, mustache, or beard, we believe that everyone can win. The goatee is a style that has withstood the test of time while surviving the ever-turbulent waters of changing styles and preferences. No matter how you envision yourself: bon vivant, metalhead, rapper, R & B fan, or “devilish,” there’s a high likelihood that there’s a goatee style for you. There are also a couple of styling tips to keep in mind if the goatee. First, pay close attention to the edge while shaving. Your beard shouldn’t extend beyond the smile lines of your mouth. Also, make sure both sides of the goatee are symmetrical; in any case, maintain sharp edges and corners at the jawline if you choose a mustache and a beard.